(Nanowerk News) XEI Scientific Inc. announces the release of the Evactron® EP at the annual meeting of the American Vacuum Society in Baltimore, MD. This provides a new approach to plasma cleaning designed for those in the physics and materials science communities building and using custom-designed vacuum systems. The XEI Evactron® EP decontamination system. The Evactron EP Remote Plasma Source from XEI Scientific uses flowing afterglow cleaning with air to clean carbon compounds from vacuum chambers operating with turbomolecular pumps. The unique new system has instant ignition from any vacuum level. It uses a low wattage hollow cathode electrode to produce plasma. It is compact and affordable. Most commercially available remote plasma sources have been designed for semiconductor equipment and thus are usually derated for the plasma cleaning of other vacuum systems. 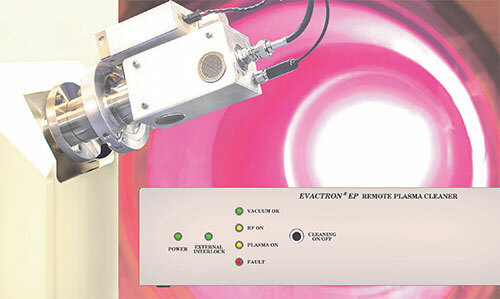 Evactron systems were specifically designed for cleaning electron microscopes safely. This high rate process cleans in minutes removing carbon acquired during exposure to ambient air, system assembly, poor vacuum practice, etc. The removal of carbon speeds pump down times improving instrument performance and stops carbon deposition by lasers and charged particle beams on optics and other sensitive surfaces. It prevents cross contamination. XEI's plasma R&D team has designed the EP system to be affordable, providing fast, reliable high performance cleaning. The critical RF generator and impedance matches are the same units used in XEI's fully featured Evactron De-Contaminators. Flowing afterglows give high oxygen radical concentrations for fast cleaning due to longer mean free paths in the 2-20 milliTorr region. A fixed input gas flow rate removes the need for pressure gauges and variable gas flow valves and control. A patent has been applied for the unique and reliable plasma ignition system that works even when the chamber is at very high vacuum at the start. For safety, a vacuum interlock allows the RF power to be turned only when the unit is inserted into vacuum. The unit is CE, NRTL, Semi-S2 and RoHS compliant. The EP system was designed with the purchase price in mind. By removing high cost components and designing the unit for easy assembly, it is now priced at less than half the cost of full function plasma cleaning systems. The front panel has only one control: an on/off switch that turns on the RF power and gas flow in the chamber to start the cleaning plasma. A computer interface connection may be used to set cleaning time, cycle cleaning, and power levels if needed. To be used the unit needs to be mounted on a vacuum chamber (NW40 or CF 2.75 flanges), vacuum and power applied, and plasma turned on.